The File List module display files for download in a nicely styled list. Login to your School Loop accounts to access Modules. Files added to the File List are stored in the locker. At the InsertModule screen, select "File List". Give the module a title using the field in Toolbar. The text will appear in the module as a header in all caps. Do not type in all caps as that is a 508 violation. 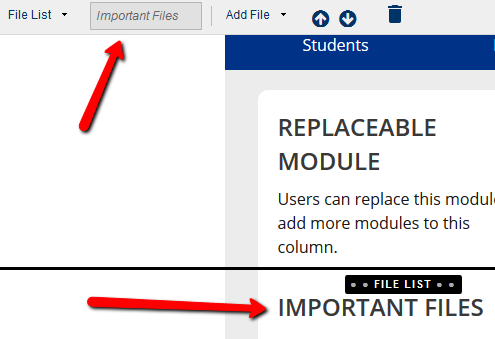 You can upload a file using the Add File button in the Toolbar, or just drag a file from your desktop and drop it onto the module. Rename files by clicking on the name in the File List and renaming it. Repeat Step 4 for every file you have to upload. Reorder files by grabbing the three vertical orange dots and moving it up or down the list.